If you happen to find yourself out west this summer, be sure to check out these trendy and tasty local eateries in Vancouver. The Diamond: Located above an unassuming pizza parlour on Maple Tree Square is one of Vancouver’s trendiest cocktail destinations, The Diamond. This Gastown mainstay fills some storied shoes, as the building has at different times in the past been home to law offices and a brothel, among other things. This colourful history lends itself well to the speakeasy vibe created at the Diamond. The dark wood, exposed brick and subdued lighting create a sense of secrecy, which pairs well with the low key, classic drink menu. 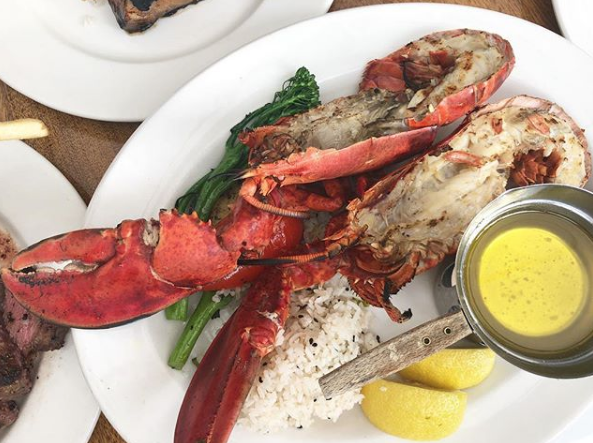 Cardero’s Restaurant: If you’re looking for a sun-soaked patio in Coal Harbour with a stunning view of the North Shore to match, you’ll find it at Cardero’s. A fresh, simple seafood-based menu with Asian influences anchors the experience, accompanied by an expansive wine list. The atmosphere inside is elegant in its own right, but the marina-side patio is definitely the show-stopper. And if you’re in the mood for live music, head next door to Cardero’s Live Bait Marine Pub to hear local talent in a more casual setting. Joe Fortes Seafood & Chop House: Nestled in the heart of downtown Vancouver, Joe Fortes has been a neighbourhood favourite for 30 years. With the wine list updating weekly, the fresh oyster and steak offerings never fail to impress. We recommend dining in the gorgeous rooftop garden – if the uncertain Vancouver rain clouds allow – although the interior of the restaurant features several distinctive dining rooms each with their own separate atmosphere. Choose from the Grand Room, the mezzanine, the wine room, or the bistro and bar area for a unique experience each time you come back. And trust us, you’ll want to come back. The Sandbar: Part of the Sequoia Company of Restaurants, just like Cardero’s, is The Sandbar. To find this little gem, you’ll have to venture out to Granville Island, a bohemian escape in the heart of the city. Before you eat, take the opportunity to explore the public market and some of the surrounding galleries, shops and theatres. Or take a tour of the popular Granville Island Brewery to help you work up an appetite. Once you’re settled at your table, take in the exceptional views of False Creek and the gorgeous interior design of the restaurant. The menu is west coast inspired and infused with Asian, Italian and Mediterranean influences.